In 2018, San José finished roughly half of its ambitious Better BikewaySJ downtown network, 26 miles of connected bikeways that will open up biking for all ages and abilities in and around downtown. NACTO is hosting a Cities for Cycling Roundtable in San José to commemorate this and present opportunities for knowledge sharing. Join your peers from across North America for three days of expert panels, breakout conversations, and hands-on design exercises to elevate a single theme: Growing and activating a citywide bike network. 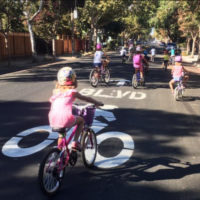 In addition to discussions and design charrettes, we’ll take our learning to the streets when the City of San José leads us on a series of riding tours of the brand new Better BikewaySJ network, more than 20 miles of downtown all ages bike infrastructure they have been building in 2018 & 2019. Join us at Víva CalleSJ, the premier open streets event in the Bay Area. Roundtable participants are invited to ride San José streets and partake in all the rich programming of the event. NACTO and City of San José will be hosting an evening reception to celebrate 2018’s accomplishments, and kick off 2019’s ambitious goals. NACTO cities will join the City of San José for a short celebration event for the new bike network, followed by a bike ride for those who can’t wait to test out some #freshkermit. After, join NACTO peer cities for lunch a day of exciting panels, group discussions, and interactive design charrettes. Learn from your peers about strategies to activate bike networks and build community ownership of active transportation, and then crowd-source design ideas from the brightest planners and designers across North America. Dive deep with your NACTO peers to share lessons on bike program benchmarking and performance measurement. Please note that all meals during the event are covered by NACTO. Please reach out to Aaron Villere ([email protected]) for more information on lodging and travel. => Join your peers from across North America for three days of expert panels, breakout conversations, and hands-on design exercises to elevate a single theme: Growing and activating a citywide bike network.